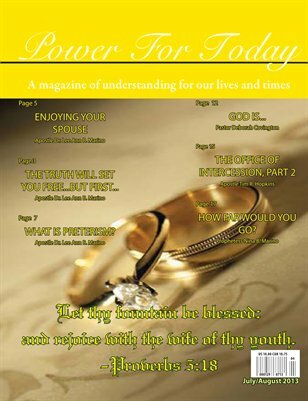 Power For Today Magazine, a monthly magazine for understanding our lives and times, is published monthly and is a publication of Apostolic Fellowship International Ministries. July/August 2013: Enjoying Your Spouse. Find your spouse challenging? Find marriage a task? Read to learn how you can enjoy your spouse and find a blessed balance between individuality and being part of a couple.